Club Penguin Cheats by Mimo777 Club Penguin Cheats by Mimo777: Festival of Flight EXTENDED! FLWOOT! The Festival of Flight has been extended! Club Penguin will keep the party here until the 20th of August. It will end just in time for the new play, Underwater Adventure, to arrive at the Stage on the 21st. That's so cool! I was going to give up buying a new membership since the party was going to end tomorrow, but now I'm gonna renew it! Thanks Mimo! That means more time to find Gary! woo hoo!!! im already a member rockoina, but now that i know the stage is goin to turn into the underwater adventure, i really am gonna pay more for more member-ship! My brother was so happy he snorted like a pig!!! <(^(oo)^)> lol!! mimo i don't think the festival of flight is as cool as the fall fair. you're right, this is the best party of all parties!!!! its awesome and saweet and phun! Awesome! I totally agree that this is the best party ever! Can't wait until the aqua party! I have answered all the clues so far! oh my gosh! that is so aweosme! now i will have more time to find G! Of course you can thank mimo! YAY! The party is extended! Sorry mimo I have to disagree! The fall fair is the best party ever!!!! Is the next clue gonna be the room, since the first one was i think for five o'clock, this last one was for the server, and the heart one was the date? Nice! I predicted this, but my brother said it wouldn't be. Well, ha ha to him! Cool! Thanks for the update Mimo! The first one was room. Second was there is two sides of it. Third, The server. QUIT ASKING!! Yes i agree with you! The Fall Fair is the best ever party, specially for non-members. I LOVED that party cuz it rocked the igloo!! LOL! Yes!! More Gary-Searching fun! more fun if you haven't found him yet! And, you shouldn't put (cpg mod) next to your name if your just commenting, only if you're answering someone else's comment! I really think that the flight festival is the best party too! Now I can finally see if I can find Gary. P.S Mimo, on the Cp's whats new post it said about trading glasses for claws? Do you know what it means? Thanks for the help Mimo! Here's a cheat probably you didn't know. On the Lighthouse Beacon the big propeller goes at regular speed, but if you move your mouse around really fast, you can make the propeller go faster. Thanks again, Mimo 777! mimo you know that poll on whaen do you go back to school i go back i 3 weeks time. Ahhhhhhhh august 20th is when my school starts! Um birdy not to be rude dont be that mean and dont give it out plz that ruins the clues. Fall fair was awesome but that was last year and i stayed at the fall fair for 3 days and hten retired cp and then came back. mimo, i think this is important but if you go in the night club and next to the badge if you click the red button the clouds and everything turns to a stormy room!! its so awesome!!! Huh? Your school starts on Aug. 30? I met Gary at Thermal at 6:10 today! He rocks! Actually, the first one waas the room. YEA! Happyblooy, You are a happy person! just like me! we should make a club! we should also become best friends :p lol. Sorry i don't usually see other Happy people on here. Gladd to see you! yeah the party is ok but most of the decorations around the Island, even the ones at the Town, make my computer lag and go really slow, even when i press the =+ button. The Fall Fair doesnt do that and that is my favourite party anyway. But the Festival of Flight is good. He is having a party soon! Look at the last few posts for clues! It's an aqua party. Hope to see you there. Wow. Great Cheat! I will make sure to do it next time i'm at the beacon. He is having a huge cp aqua parrty. Mimo, the fall fair is so much better. This party is lame and I'm bummed that it is longer. It's normal club penguin without water. The only good thing about it is the jetpack. I bet it stinks for nonmembers since they only get a dumb green propeller cap, which they already have two. Thats cool! Im gonna try that now! To celabrate CP times 200 issue, I'm trowing a HUGE party. I think. Anyway all of you are invited. Where- Server Sasquatch Room Dance Club Lounge. P.S dont ask about time! idk about time zones! lol sorry! OMG OMG OMG OMG OMG! MY HIGHEST SCORE ON THE DANCE GAME! 21,176! Can you BELIEVE it??!! Awesome, huh?? P.s. BEAT MY SCORE IF YA CAN AND POST IT! Just use the cp time! we won't be able to come probly if you don't have a time! You can skip all the time zones if you say cp standard time... and my time is the same as cp time, but others can check the cp time every once in a while to come. ALWAYS make sure to include time for parties. You really should post all your clues in like one day. I don't like waiting. Congratulations Safa153! That's 3 hints in a row. If it is successful by Mimo maybe you will even be a Cheat Finder! Matthew722 probably has a higher score. I don't know how he does it but he is ridiculously good at it. Hey Random Matthew 722, your not on my friends list anymore! ;( At Mimo's party you should add me again! :D And guys, all of us commenters should add each other, that'd be cool. And then we could all gather sometime and talk about Mimo's sight and go on Agent Patrols and raid the Pizza Parlor, make a radical band in which we're all a certain color and that'd be rad! 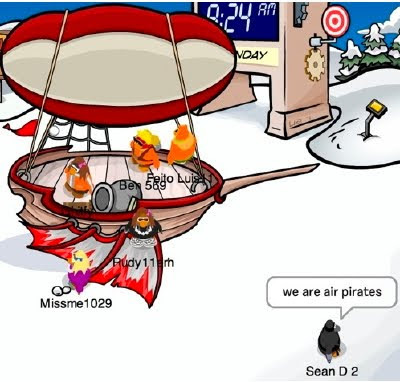 So if we're all friends we could have band practice at each other's igloos! That's be so awesome! Also, right now I've been workin' on earnin' up 200,000 coins. I have 184,000 and so yeah, i wanna get 220,000. Wouldn't that be cool? Then, at the Coins For Change i could donate 20,000 coins OR MORE if i stay a nonmember and earn up a gajillion coins. But i am gonna become a member probly next month if possible. I'm gonna post a short story of mine that i made this last year. It would take up a lot of room, sooo... I'm not sure if Mimo will post it but i hope so! Hope you will like it Mimo! It'll be my next comment. That is SO awesome!!!! I like cheese! I think Matthew722 and Zxz192 has a higher score because they're like undefeated champions! But congratulations! Clue #1 is considered a Room Clue. He already did all the clues now we have to figure out the time clue! He is having one featuring the Aqua Party! Check the post below for clues 1-3! LOOL! Your brother must be really crazy! You can use Mimo's Tracker! It works 100%! The Festival of Flight is really cool, but I was kinda upset when I found out that the Hot Air Balloon was only for members but still! Also try beat my score in Hydro Hopper of 1597. Hey mimo! I found out a EPF CP sighting! have you noticed that in the lighthouse, by where the ninja used to be, there is a snow trekker in a bottle! There's a new Tour Guide description at the pool; just for party... So, check it out! If I were a member; this party would be best for me...But it's not... My favourite parties are Camping Party 07 and Summer Party 07! Camping Party was really different; and CP had it once. Summer Party 07 was really awesome because there were FIVE free summer items! Even though we do have more time to find Gary, it doesn't mean that we will! The Mimo Tracker helped though. I might be able to come! Yes, i love this party but how do i get to the mimo tracker like seriously idk how to?!?!?!?!? Yea, in some areas, people start school a different day. I start school August 30th too. XD lol. Sorry friends! I'm out for the day! won't be back til 5:15 PM PST! Have a great day! Especially all you Wagonites out there! THanks dude! you rock to! i think im gonna want to be a cpg mod but how many comments or questions do u have to answer? sorry Snowleo 20 it IS the best party ever. No-one knows how many. Not even Mimo. He just looks at how well you are doing, and if you are doing good enough, Then he will promote you. I myself am still trying to become one. Mimo has a post on the right hand side. Remember to always say (CPG Mod) after a reply, even if you aren't one! i think the fall fair is better by my opinion. There's a new book in the Unlock Items Online thingy. Im sorry but i have 2 disagree with u. My mom started me on clubpenguin about 2 years ago and me and her agree that the olympics were the best. I love the festivle of flights. mimo in the nightclub above the stairs theres a red button press it and it turns into a thunder storm. Thanks for the tip but Mimo already knows this and posted it about a few weeks ago! Sorry,but Mimo posted that already.Thx for telling us!! His twitter name is Mimo777. Actually, it's not a glitch. I'm sure Club Penguin put that in there. Kinda like how the Lighthouse's bulb turns on and off. Cool! Thanks for the cheat dude! Maybe he will give you credit! I started August 12th and I will be done at the middle of May. Have a great rest of summer! No, the first one was the room. Good luck and I hope to see you at his party! it is ssoo not better than fall fair! thats the best party! I can't wait for the new play at the stage. NOBODY WOULD HELP ME OUT THOUGH!!! I can't find Gary :( How do you guys find him so easily? I tried looking all yesterday and I came op empty. Help? i would have to disagree, the fall fair is SOOOOOO MUCH BETTER, but this one is pretty cool too. you rock mimo!u have very cool info!